¶ 3 Leave a comment on paragraph 3 0 Talkin’ New York is a “talking blues”. The talking blues go back at least to the time of the minstrel shows, which were very popular in the early twentieth century. Some researchers believe that Chris Bouchillon, a white singer from South Carolina, invented the form out of necessity: he couldn’t sing worth a damn. ¶ 5 Leave a comment on paragraph 5 0 Woody Guthrie helped popularize the talking blues. Dylan had an intense affection for his work. 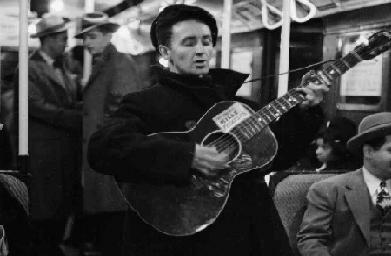 In the excellent documentary Folkways: A Vision Shared, he refers to his early self as a “Woody Guthrie jukebox”. He surely picked up the style from him. Many of his talking blues betray an obvious influence. ¶ 6 Leave a comment on paragraph 6 0 Dylan has always been a liberal borrower from other people’s work. As the more devoted Dylan students may remember, there was a lot of discussion concerning Dylan’s borrowing from Junichi Saga’s novel Confessions of a Yakuza: A Life in Japan’s Underworld for his Love and Theft recording. What many don’t realized is that borrowing from other people’s work is a common practice in folk music. The term “folk process” is frequently used to describe it. Below are Dylan’s thoughts on the subject. ¶ 8 Leave a comment on paragraph 8 0 “What happens is, I’ll take a song I know and simply start playing it in my head. That’s the way I meditate. A lot of people will look at a crack on the wall and meditate, or count sheep or angels or money or something, and it’s a proven fact that it’ll help them relax. I don’t meditate on any of that stuff. I meditate on a song. ¶ 9 Leave a comment on paragraph 9 0 “I’ll be playing Bob Nolan’s ‘Tumbling Tumbleweeds,’ for instance, in my head constantly – while I’m driving a car or talking to a person or sitting around or whatever. People will think they are talking to me and I’m talking back, but I’m not. I’m listening to the song in my head. At a certain point, some of the words will change and I’ll start writing a song. ¶ 11 Leave a comment on paragraph 11 0 Dylan borrowed quite a bit for Talkin’ New York, the first original song he recorded. According to Manfred Helfert (www.bobdylanroots.com) the lyrics are derived from Woody Guthrie’s Talking Subway Blues. No doubt about that, have a listen…. ¶ 13 Leave a comment on paragraph 13 0 Dylan’s song is definitely similar. It follow the same general narrative structure: arriving in New York, traveling through the town, looking for a job, and generally having a tough time. ¶ 14 Leave a comment on paragraph 14 0 There are a couple Guthrie references in the song. That some people rob you with a fountain pen. ¶ 19 Leave a comment on paragraph 19 0 “So long, New York/Howdy, East Orange” is another Guthrie reference. During his long decline from Hodgkin’s disease, Woody’s friends Bob and Sidsel Gleason brought him to their East Orange, New Jersey home on the weekends to visit with friends and relatives. ¶ 20 Leave a comment on paragraph 20 0 Paul Williams, in the first volume of his Performing Artist series, points out an interesting quirk of Dylan’s songwriting, a technique that he would use many times in the future. Notice how Dylan switches the verbs swung and grabbed in the following lines, subverting the listener’s expectations.